The third season of "Game of Thrones" had some undeniably memorable moments (hint: "The Red Wedding") and now you can own them. "Game of Thrones: The Complete Third Season" comes to Blu-ray, DVD and Digital Download on February 18, 2014. Just in time to cram for the fourth season which is due to air this spring. The set comes "loaded with exclusive bonus content including comprehensive guides, illustrated histories and an in-depth look at "The Rains of Castamere." 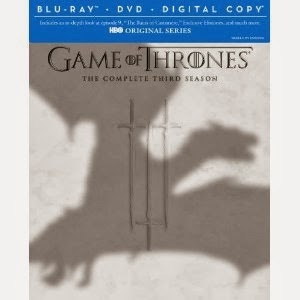 From the press release, "The Blu-ray with HBO Select and DVD bonus materials in 'Game of Thrones: The Complete Third Season' contain multiple featurettes, extended and deleted scenes, and audio commentaries. Additional features on the BD release include interactive guides, illustrated histories, and an extensive feature on the creation of 'The Rains of Castamere,' containing nearly two hours of never-before-seen material, as well as new looks at the infamous 'Red Wedding.'" -In-Episode Guide - In-feature resource that provides background information about on-screen characters, locations and relevant histories. -"The Rains of Castamere" Unveiled - Get an in-depth look at the creation of the most pivotal episode of Season 3 in this comprehensive exposé featuring cast and crew. -The Roots of Westeros - Explore the interconnected web of relationships, rivalries and conflicts between the noble houses of Westeros with this interactive guide. -Histories & Lore - Learn about the mythology of Westeros as told from the varying perspectives of the characters themselves. -"A Gathering Storm" Featurette - Look back at the stormy events of Season 2 in this 14-minute recap with cast and crew. -"The Politics of Marriage" Featurette - The concept of matrimony in Westeros is all about making power plays and political alliances. Cast and crew examine this ancient institution and its place in Game of Thrones. -"Inside the Wildlings" Featurette - Go beyond the Wall with this introduction to the wildlings to gain a better understanding of their backstory. -New Characters of Season 3 - Meet the new faces in Season 3: Olenna Tyrell, Missandei, Mance Rayder, Tormund Giantsbane, Orell, Jojen & Meera Reed, Blackfish & Edmure Tully, Thoros of Myr and Beric Dondarrion. -Deleted/Extended Scenes - Five deleted and extended scenes. -Audio Commentaries - 12 commentaries with cast and crew including David Benioff, D.B. Weiss, George R.R. Martin, Lena Headey, Emilia Clarke, Michelle Fairley, Kit Harington, Richard Madden and more.